Not sure how this depicts Strength or Fortitude? Click here. Etteilla: Strength, Heroism, Courage, Mental Work, Sovereign, Government, Quarrel. Lévi: This Hieroglyph depicts a woman, crowned with the vital lemniscate, who closes, quietly and without effort, the jaws of a raging lion. 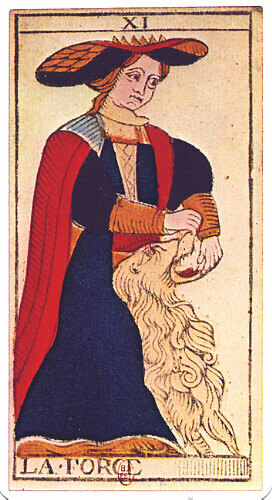 Illustration (left): Strength from Tarot de Marseille by Nicolas Conver (1761), re-published by Héron. Click on the image for a larger one. Christian: This Arcanum is represented by the image of a young girl who with her bare hands is closing, without effort, the jaws of a lion. It is the emblem of that strength which is communicated by faith in oneself and by innocency of life. Papus: Only two ideas are expressed by this Arcanum: strength and vitality. Felkin: This card also represents the mastery of the lower by the higher. But in this case it is the soul which holds in check the passions, although her feet are still planted on earth, and the dark veil still floats about her head and clings around her. Waite: The higher meanings of this card are intimated in a concealed manner by the chain of flowers, which signifies, among other things, the sweet yoke and the light burden of Divine Law, when it has been taken into the heart of hearts. This card concerns the confidence of those whose strength is God. Wirth: The lion is not an evil animal in spite of its ferociousness. There is, therefore, no reason to kill it, even within our own personality, as the ascetics do. The Wise man respects all energies even when dangerous, for he is of the opinion that they exist to be caught and wisely used. Case: The Great Secret depicted here is the law that subconsciousness is at all times in control of every subhuman manifestation of cosmic energy. The extent of this control is far greater than is usually supposed. Crowley [who replaced Strength with Lust]: Lust implies not only strength, but the joy of strength exercised. It is vigour, and the rapture of vigour. There is in this card a divine drunkenness or ecstasy. This signifies that the type of energy described is of the primitive, creative order; it is completely independent of the criticism of reason. 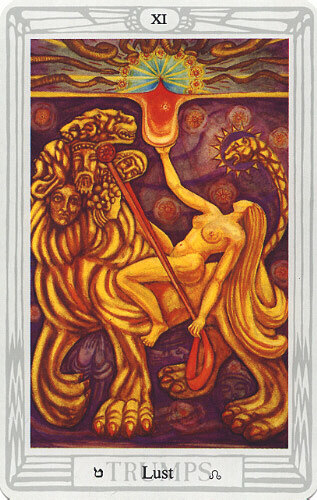 Illustration (right): Lust from The Thoth Tarot Deck designed by Aleister Crowley and painted by Lady Frieda Harris (copyright &COPY; 1944 Ordo Templi Orientis). Click the image for a larger one. Gray: Spiritual power overcomes material power. The triumph of love over hate, the higher nature over carnal desires. Sadhu: The meaning of the card is easy to understand. It enumerates the necessary conditions for the arising and application of evolutionary forces: knowledge of the Astral (lemniscate over the womans head); purity of intentions (virginity being the symbol for it), and faith in oneself (her unconstrained attitude). 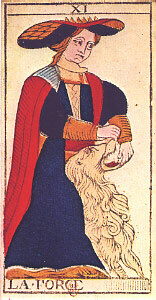 ONeill: The Strength card indicates that the time has come to approach the lion of the instincts. Not to beat it down with the sword, but to tame it; to teach it to channel its tremendous strength. The advice on this card, the advice for gentle strength comes from optimistic Gnosis. The advice is not to gain supremacy by force. Pollack: Briefly, the image suggests the energy of the unconscious released and calmed, tamed by the direction of conscious understanding. However, we can also see it as the need to confront feeling and desires long hidden from our conscious thoughts. Turk: Strength represents your ability to reclaim the power which is rightfully yours. The inspiration which invigorates you and enables you to drive forward is a strong feeling of confidence in yourself, your motives, and the environment you have prepared for this resounding success. Symbol (top): It has two parts. The part on the left is best viewed sideways and depicts the head of a woman over which appears a lemniscate. The part on the right is best viewed normally and depicts a male lion. These elements often comprise, in part, this Arcanum.